Soul Food in Boston…not. A recent article in the Boston Globe, Savoring a healthier, revitalized soul food by Peggy Hernandez bothered me a bit. Not because I’m not interested in healthier soul food (I am and do) but because of the fact that only one local restaurant cited in the article serves soul food and is owned by Black people. How you gonna have two of three restaurants in a soul food article be owned by white people? The article features the recently published Soul Food: The Surprising Story of an American Cuisine One Plate at a Time by Adrian Miller, a food historian, who visited the Boston area. He visited Bethel A.M.E. Church and spoke about his book. According to the reporter, parishioners there suggested he visit two restaurants, Blue Ribbon Barbecue (in Arlington and West Newton) and Sweet Cheeks (in the Fenway) for healthier soul food. Shame on them if they did. Both Blue Ribbon and Sweet Cheeks are owned by whites and don’t claim to be Soul Food restaurants although they do claim southern roots/affinity. 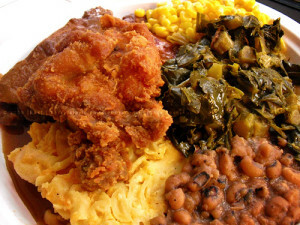 Soul Food has always meant traditional Black American cuisine with Southern roots both from the period of African captivity better-known as slavery where Black American cooks elevated the scraps they were given to eat, which retained some African elements in the New World. Black Americans and White Southern Americans ate much of the same food (even today in many “Southern” kitchens especially white-owned barbecue spots down South, the cooks are often Black). Darryl’s Corner Bar & Kitchen – While Darryl’s is dedicated to the Bar and Music it also serves soul food including the famous fried chicken made famous by the original soul food restaurant it is a successor to: Bob the Chef’s. Slade’s Bar and Grill – Great Soul Food with live music and dancing. It’s a bar. Best fried chicken wings in town and delicious collard greens that are clean (no salt pork or ham hocks detected). United House of Prayer Kitchen – Cafeteria-style kitchen serves Soul Food 7 days a week now now only open on weekends in Dorchester in a building behind the church (founded by Daddy Grace). Don’t seem to have their own website. Inexpensive and abundant portions. I’ve taken tour groups there several times. Maxine’s On Saint James (Louisiana/Southern Cuisine) – I was walking down Dudley Street from St. Patrick’s Church to Dudley Station when I spotted the lovely sign on this spot at 304 Dudley Street near Orchard Gardens. When I walked in, the smells were de-li-cious but I couldn’t sample because there was not one spot to sit – not even a counter! I grabbed the menu and spoke briefly with the chef. They don’t have a website or an email or a fax # either. (Sigh…no, Damn…no, Really?) – “Catering, Delivery, Curbside only” the menu states. Open Mon-Sat., 11:30am-7:00pm. (617-427-0927). The menu lists chicken-n-waffle, fried pork chops, a variety of Po’Boy sandwiches, several fish/shrimp dishes with grits, requisite sides and desserts. The menu is fairly slammin’. Too bad the spot, itself is not. Perhaps they will grow to be so. Next Step Soul Food Cafe – In Dorchester. Located near Codman Square Health Center, I’ve eaten here once – had fried fish. The owner, Michele White, was warm, friendly and spoke to me her plans for the restaurant which is still evolving (no peach cobbler when I went!). I will go back. Here’s the review, Soul food with heart at Dorchester’s Next step, written by Ellen Bhang, that appeared in the Boston Globe in March 2017. Handy’s Cafe – Dorchester (Upham’s Corner) formerly in a small sport in Adams Village has reopened in Upham’s Corner on Columbia Road. They serve breakfast and soul food for lunch and dinner. The meal I had was good (friend fish cooked to order, collars and sweet potatoes) but the service is very slow and erratic just as it was at Adams Village. The friend who I met there said this is generally how it is. Don’t go if time is an issue. Some of the most sublime soul food I’ve ever tasted was at Bully’s Restaurant in Jackson, MS. Fast service from a waitress who was warm and personable but also all about business; all selections on the menu were available and delicious; and the prices were amazing. Here’s a link to a wonderful article about them in Southern Foodways, Portrait of a Place. Review of 1997 Soul Food movie starring Vanessa L. Williams, Michael Beach, Vivica A. Fox, Nia Long, and Irma P. Hall as the matriarch among others. A Taste of Country Cooking by Edna Lewis – the now deceased, elegant grand-dame of Soul Food and Southern Cuisine. My mouth is watering already! Where I live, it’s a challenge to find a soul food restaurant with healthier menu choices. If I make it to Boston again, I’d like to visit a few of the restaurants you mentioned. Thanks for taking the time to leave a comment. I’ll be adding another restaurant based on suggestions from two readers. Do be in touch if you ever get back to Boss-town. I found a link to this post on twitter, and I’m very glad I found it! Thanks for a very interesting piece. There’s a couple of places I’ve never heard of, and I can’t wait to try them out. One old favorite of mine that’s not on list is Coast Cafe, near Central Square in Cambridge. Not much seating (maybe only two stools?) so it’s mostly takeout. http://www.coastsoulcafe.com/ Check it out if you’ve never been. It’s really good but also it’s pretty much it for soul food in Cambridge. Thanks for taking the time to read my post and to tell me about the Coast Cafe in Cambridge. I’ll check it out and add it to my list. Be well. You and another reader hipped me to the Coast Cafe. I’ll check them out and update my post. Be well. Great post! Thank you so much for the lesson, and the list. Thanks for taking the time to read and to leave a response. Based on reader feedback, I’m adding another place to the list. I didn’t know there were so many soul food restaurants in boston. I shall use this list in the near future. I love the article. I’m sure there are more than I know about. Thanks for reading and commenting. I love your comments regarding “Soul Food restaurants in Boston” and I agree that we need more places. I also have one suggestion: Larry J’s BBQ Cafe located on D street on the waterfront near Seaport Blvd. They typically serve Texas style BBQ with southern style side dishes. We ordered the fried fish sandwich special and were very pleased. Thanks for suggestion and for taking time to comment. While it doesn’t meet the definition of Soul Food it does sound southern-delicious.